Hi all! I am wrecking my brain today, as I need to make a decision regarding a headboard for the guest room. Since it in the guest room, I only want to spend around $100. All of the options below meet that budget but I just can’t decide. I could DIY something, but I just don’t think I will have the time. The walls will be dark gray, so I am thinking of a lighter fabric headboard, but rustic like wood tones are keeping my interest, along with vintage style iron frames. Sometimes even a pretty white headboard crosses my mind. Sigh. So what do you guys think? Based on the inspiration board that I shared yesterday, what style headboard inspires you for this room? I have to admit…I am stumped. Help me out. Which one should I go with? Thank you in advance. I think the lighter color would make the walls stand out more. Let me know how you make the headboard, I would love to do something like for my guest room as well. Thank you Cheryl! I think I made up my mind and am trying to come out of what would be my comfort zone so stay tuned! Thanks for stopping by. I would go with a lighter color. Perhaps an old door hung horizontally for a rustic look? thank you Audra. I appreciate your input. I am trying to think a little out of my comfort zone so please stay tuned to how it turns out. Thanks for reading! 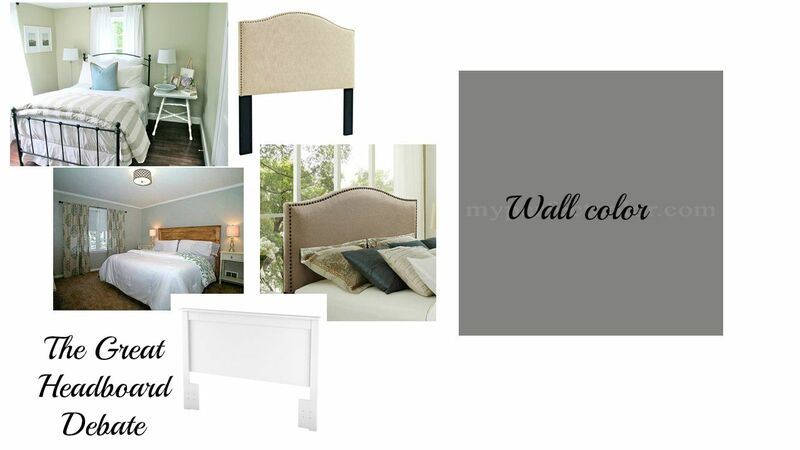 Now that I see the wall color, I really like the darker upholstered headboard. It would have a moody vibe and I think that would look so good together. Can't wait to see which one you choose. Just from our experience the iron frame involves a lot of dusting each week. Something I hadn't anticipated, but I guess it's to be expected.